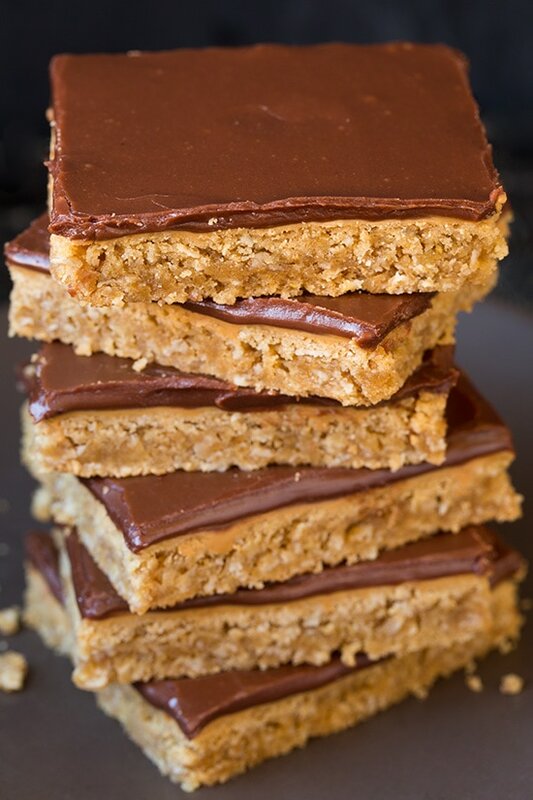 Peanut Butter Bars are one of the best treats! You get a chewy oat cookie base that’s loaded with peanut buttery flavor, then it’s topped with a layer of peanut butter after baking and finished with a decadent chocolate frosting. Trust me this is a staple recipe! A Long Time Family Favorite! These are one of my favorite childhood treats. My mom and everyone else I know always made them. 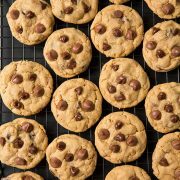 They are perfect for parties because they make a full cookie sheet, and adults and children alike absolutely love them. I mean, who doesn’t love the chocolate and peanut butter combo, and who doesn’t love cookie bars and frosting? I made them yesterday and it’s one of those things where I kept going back and cutting off a thin slice, then another, then another and then I woke up for breakfast at it was the first thing I just had to have a taste of. They really are one of the most tempting desserts you’ll ever make! Try them and you’ll see what I mean. Even though they do have several layers these really are a breeze to make. Preheat oven and butter a rimmed baking sheet. 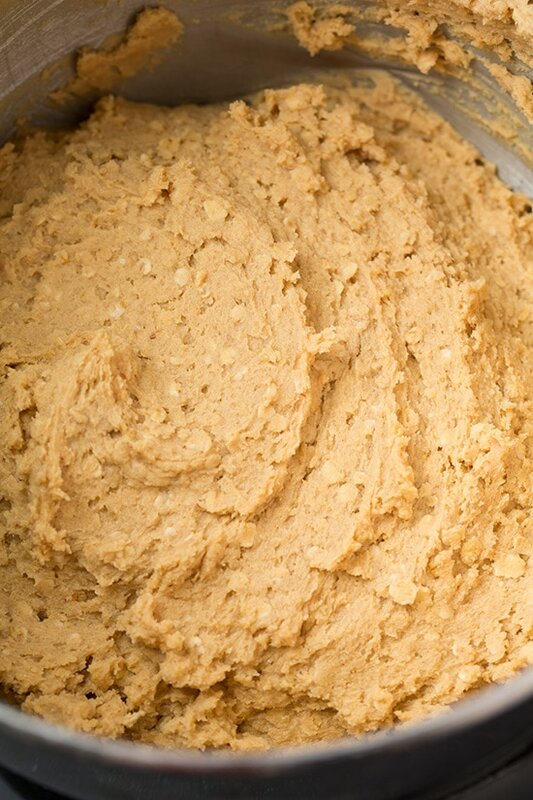 Mix in eggs one a time then blend in peanut butter and vanilla. Cool briefly then dollop over peanut butter, let peanut butter melt then spread. 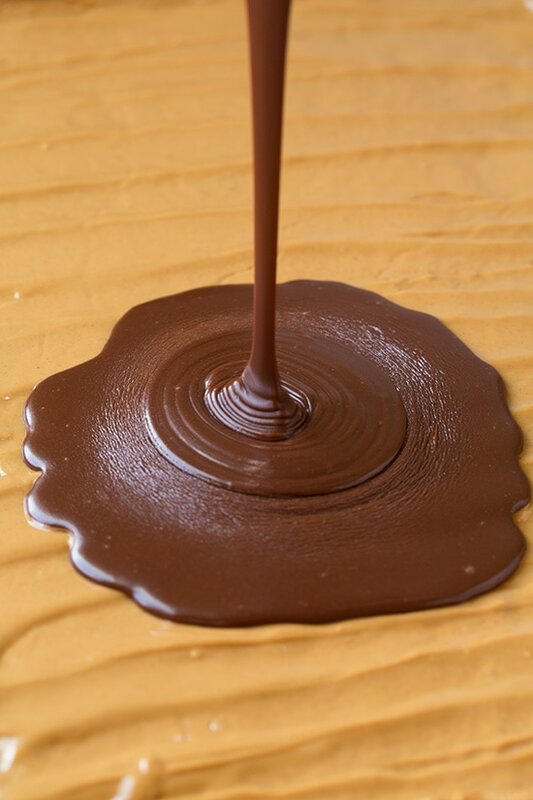 Prepare and pour over chocolate frosting then spread into an even layer and let set. Don’t use crunchy peanut butter or it will through the recipe off. Add peanut butter while cookies are still warm so it melts nicely and sort of absorbs into the cookies a little. Be careful not to over-bake these or the edges will be dry. Plus they’ll continue to cook just a little once removed from the oven from the heat of the baking sheet. 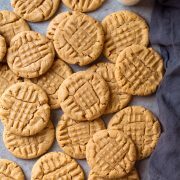 More Peanut Butter Recipes You’ll Love! 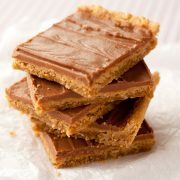 Peanut Butter Bars are one of the best treats and they're great for parties because they make enough for a crowd! 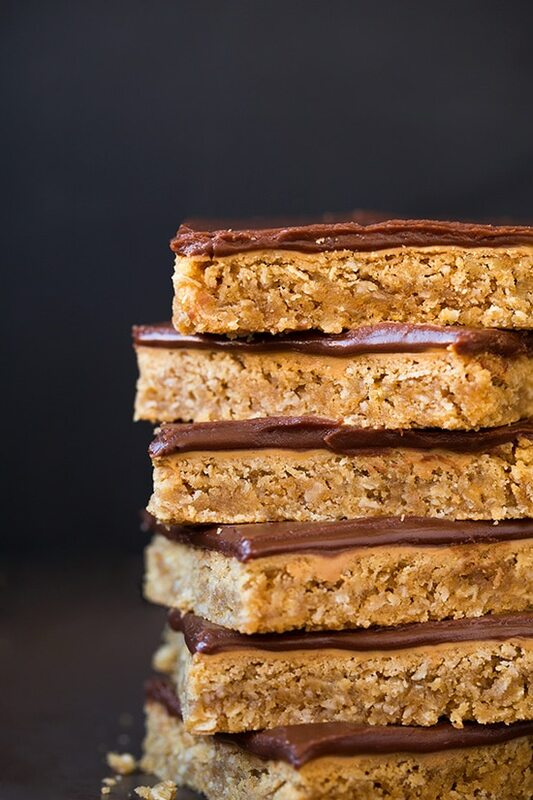 You get a chewy oat cookie base that's loaded with peanut buttery flavor, then it's topped with a layer of peanut butter after baking and finished with a decadent chocolate frosting. Preheat oven to 350 degrees. Butter a rimmed 18 by 13-inch cookie sheet. In a mixing bowl whisk together flour, oats, baking soda and salt. Set aside. In the bowl of an electric stand mixer fitted with the paddle attachment, blend together butter, brown sugar and granulated sugar until creamy. Mix in eggs one at a time. Blend in 1 cup peanut butter and the vanilla. With mixer set on low speed, slowly add in flour mixture and mix just until combined. 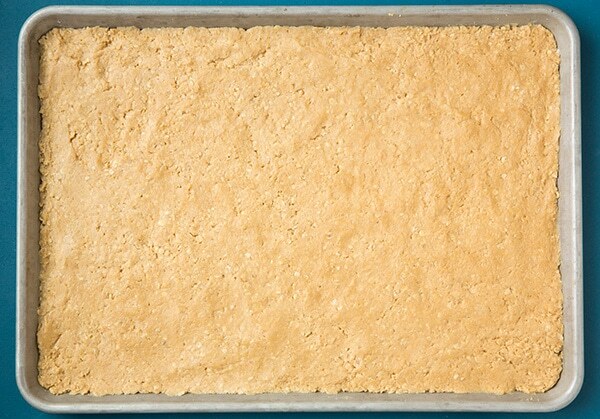 Drop cookie dough onto prepared baking sheet. Spray hands with non-stick cooking spray and spread dough into an even layer. Bake in preheated oven 12 - 15 minutes until golden (see notes). Remove from oven and cool 5 minutes, then dollop remaining 1 cup peanut butter by spoonfuls over top. 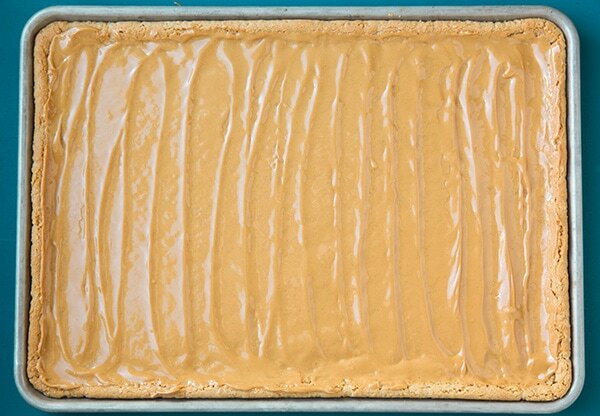 Let sit 1 minute then spread peanut butter into an even layer to cover top. Melt butter in a medium saucepan. Stir in cocoa, milk and salt and bring mixture just to a boil over medium heat. Remove from heat and whisk in vanilla, then stir in powdered sugar and mix until well combined (if needed you can add 1 Tbsp hot water to thin). Immediately pour over bars and spread into an even layer. Allow frosting to set then cut into squares. Store in an airtight container. Be careful not to over-bake or edges will be dry, don't wait for it to be golden brown. They should be puffed and beginning to set but still soft.